Gaye Theresa Johnson – mother. scholar. freedom dreamer. Gaye Theresa Johnson writes and teaches on race and racism, cultural history, spatial politics, and political economy. Her first book, Spaces of Conflict, Sounds of Solidarity: Music, Race, and Spatial Entitlement in Los Angeles (University of California Press, 2013) is a history of civil rights and spatial struggles among Black and Brown freedom seekers and cultural workers in LA. Johnson’s second book is titled The Futures of Black Radicalism, and is co-edited with Alex Lubin (Verso Press, 2017); she is currently working on a third book titled Let’s Get Free: Social Protest at the Intersection of Mass Incarceration and Immigrant Detention (UNC Press). In it, she demonstrates how visual and aural protest art constitute one of the most significant discourses of resistance to twentieth and 21st century anti-immigrant and pro-carceral policy and practices, revealing how expressive cultures enact an alternative narrative history about migration, race, and power. Johnson has also contributed journal articles and book chapters to historical, cultural studies, and ethnic studies volumes. She has been a visiting researcher at Stanford University’s Center for the Comparative Study of Race and Ethnicity, as well as at the African Leadership Academy in Johannesburg, South Africa. She has been active with the Los Angeles Community Action Network and the National Day Laborer Organizing Network. 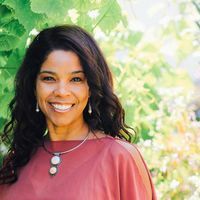 She is the Board President of the Central Coast Alliance United for a Sustainable Economy (CAUSE) and an advisory board member for both the Goldin Institute and the Rosenberg Fund for Children. Johnson received a B.A. in Sociology and Ethnic Studies from the University of California at San Diego, and a PhD in American Studies from the University of Minnesota.